Previously I wrote about the main web browsers that have versions running on both Windows and Apple’s Mac OS X. Here I’d like to show readers even more browsers! But first, what’s with ’part not-quite 2’ you ask. Fair enough. It is odd, eh? What has happened is that I have lost access to Windows. * Before all the Windows (or Linux) users rush off, please read the next section: the challenge applies to all platforms and is the underlying point behind me trying to point out the ’other’ web browsers. I think it’s worth thinking about regardless of what operating system you use. I’d like to challenge to readers adopt a task-oriented approach, using whichever browser is best suited to the specific task at hand. Essentially all modern web browsers use one of the open-source rendering engines,** the software that takes the ’code’ for web pages and renders them into graphics. These rendering engines are top-quality and up-to-date. The effect is that even niche web browsers are as capable of presenting web pages as the better known browsers. It also frees the developer to focus on user features, rather than raw presentation of web pages. As a result there are many ’smaller’ web browsers, some with interesting and useful features. What smaller development teams (or individuals) can usefully do is focus on just one or two features that they’d like to see and present them to users. By taking a task-oriented approach you can exploit these and, while you’re at it, support the smaller efforts. I’ll illustrate the concept using a browser most people will be familiar with, but the same concept applies to the lesser-known browsers. Ideally you name files for their content, so that later – when you are reading only the filename – you are reminded of what they contain. For simple pages the dialog hiding the content isn’t much of a problem but if you’re trying to save an academic research publication using the citation as the filename – e.g. Miller et al 13(6)664.pdf – it’s a mindful to try memorise the independent bits that make up the citation (author, volume number, part number, first page). I do manage to most of the time, but it’s a hassle and more work that it needs to be. It’s far easier to use Firefox for downloads, as the Save As dialog Firefox presents can be moved to one side so that I can read the different parts of the citation that make up the filename from the web page. I’ve used a task-oriented approach that exploits one feature that suits my needs for the particular task. This exploits that modern computers are more than capable of running several programs at once; why not use the appealing features from each program rather than limiting yourself to what just one program offers? I’d like to challenge readers to try locate individual features in different web browsers and use a task-oriented approach, rather than clinging to just one browser and putting up with it’s flaws. In particular, I’d like to challenge readers to look at the smaller developers for ’that one feature’ (or more) they offer. Below I’ve listed some of the ’second-tier’ browsers that run on the Apple Mac OS X platform. *** With the exception of iCab, the rendering engines of these web browsers are the same as used in their better-known cousins: all the browsers listed present web pages just fine. Some of these offer quite interesting features and I would encourage readers to try them. Of those shown Camino is less novel, having ’traditional’ Mozilla-type feel to it. Sunrise The first of two Japanese efforts in this second tier list is under very active development, as a visit to their website will show. My (vague) memory has it that it once had some rather unusual features that were interesting for a developer, but it seems to have moved away from this. It now focuses on an ‘all-in-one-screen’ approach, opening to cover the full screen. This is not to my personal taste, but others may prefer it. The screen snapshot feature looks interesting and one I am likely to use: it directly generates and exports a graphic image of the page in variety of formats. Try altering settings: Sunrise uses some fun graphics to move from one setting to another; if for nothing else it’s worth fooling around with this for a while! Shiira The second of the two Japanese efforts, this now hasn’t been updated for about a year but was once under very active development and I browser that I thought had a lot of promise. It uses tabs either in the manner most other browser do or via a ‘page dock’ showing miniature images of the page that may appeal to some. You can scale the size of the items in the page dock imply by moving the bar separating the dock and the main panel. The browser comes with an Amazon plug-in (which I haven’t tested) and can share bookmarks with Safari and Firefox. Camino has a, to me, ’vanilla’ feel to it. This isn’t surprising as it is essentially Mozilla brought up to speed. But if traditional is your thing… there you have it. 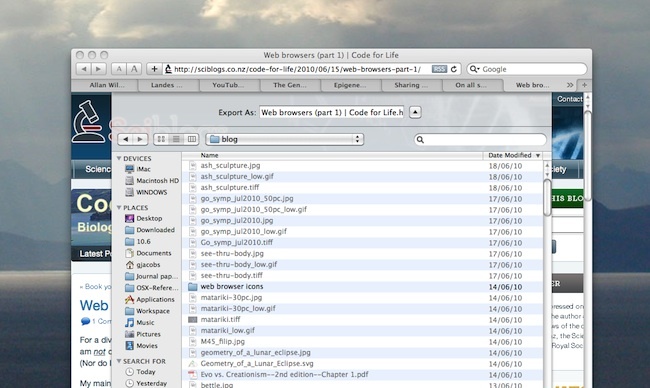 The last update at the time of writing, version 2.0.3, was released in 25 May 2010. It is a very complete browser (although it will now have a very small slice of market). One feature appeals to me: the tab overview allows users to easily see all tabs at once. iCab This browser isn’t free, but shareware. Like most ’commercial’ browsers, it has a lot of good features. One reason I am listing this here is that the older versions of this browser are ’the’ recommended browser for those that ’insist’ on running old (as in very old) Macintosh computers whose CPUs really haven’t got much in the way of performance. Even if you are running newer machines, download a trial and give it a whirl. Amaya is intended for developers, not end-users. The idea is that this W3C-based project offers a free interactive web-development platform. It personally feels rather clunky to me, and the interface will confuse OS X users. (There are Linux and Windows versions.) Nonetheless, it is free. One reason I list it here is in the small hope that more contributions (programming-wise) to this effort might produce something more worthy of the considerable effort that has already gone into it. Amaya includes an SVG editor and supports CSS 2. Lynx – I mention this as my first experience of the WWW was using a text-only tool that ran under Unix ’terminal’ screens, as this browser does. It’s a very different experience to modern web browsers. I would encourage readers to try experience a modern take on how things once were. It is considerably more advanced that the text-only browsers of the early days, but it will still give the flavour of things. I’d include OmniWeb, but I believe development on this has stopped. A thought for developers: by including sharing of bookmarks from the main browsers (as Shiira does), you may better encourage users to use the specific features on offer for particular tasks as it will less ‘either-or’ for them. * I use virtualisation to host Windows. I’ve updated the OS (operating system) and unfortunately it seems that I need to also update the virtualisation software to enable it to work again. This will happen soon, but not soon enough for readers to wait for… I’m terribly sorry about this; I hate leaving readers in the lurch. ** For example the Gecko engine that underlies Firefox, or WebKit that underlies Safari and most of the web browsers in this article. Opera and Internet Explorer have their own, proprietary, rendering engines. *** Amaya and Lynx will have versions that run on other platforms.